Is a property boom in Malaysia causing a fisheries bust in Penang? 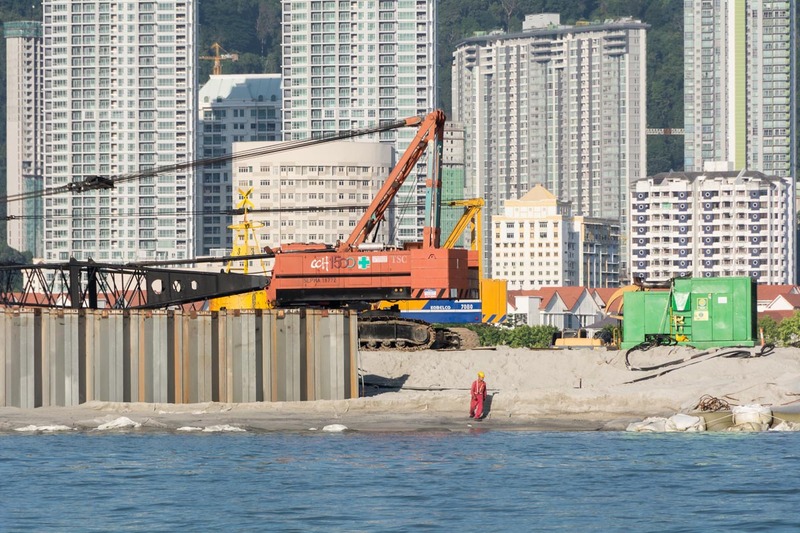 Driven by high demand for housing, developers in Malaysia’s Penang Island are artificially expanding the coastline and planning to construct new islands. Local fishers say building works have already damaged their livelihoods, and fear further construction will destroy their fishing grounds. Mangroves and endangered bird species are also threatened, and the mining and transport of construction materials could spread adverse environmental impacts beyond just Penang. PENANG, Malaysia — Fisherman Liew Hock Choon, 50, cut the outboard engine and explained that we have arrived at the position of one of his fish traps. “No GPS,” he said. Using a method called triangulation, his keen eyes pinpointed natural markers on the shoreline and used these bearings to locate his traps with incredible accuracy. With an anchor thrown down, he snagged his trap and hauled it up. The deck was soon awash with flapping fish. These are grouper — prized in the restaurants of Penang and beyond, they fetch a premium price and can only be caught with hooks or traps, Liew explained. He said customers travel from as far as Hong Kong to buy these prized delicacies. “Look at this mud in the traps,” Liew complained as just two of his four traps contained a catch worth keeping. Still, it was a good day under the circumstances. One phone call later and the 11 kilograms (24 pounds) of grouper were snapped up by a restaurant owner eager to purchase them for over 500 ringgit ($113). They were still alive when Liew delivered and weighed them while hungry customers looked on. 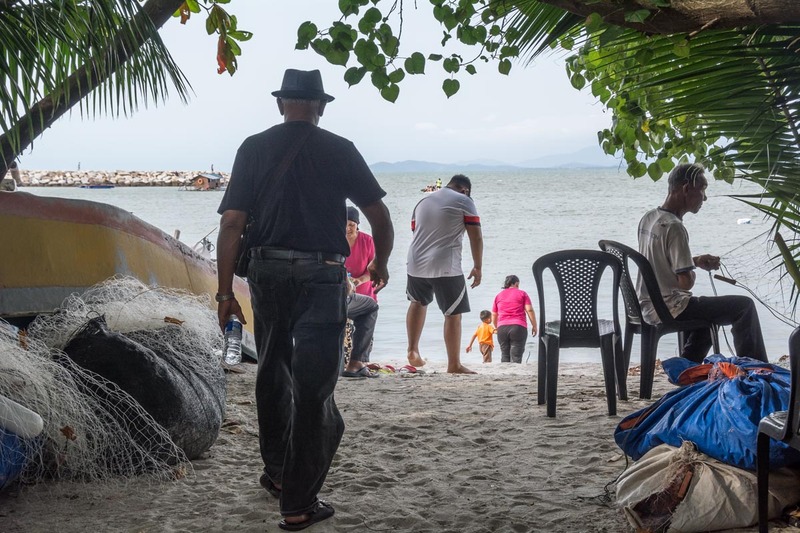 “I know this area very well because in my school days I followed one of the fishermen,” said Liew, from Tanjung Bungah a village North of Penang Island’s capital Georgetown. Now the days of his fishing grounds are numbered because of a land reclamation project by a local property developer. “This area is very rich with mud crab, shrimp, snapper, and grouper, but soon it will all be gone,” said Liew. Penang fisherman Liew Hock Choon, 50, is from Tanjung Bungah a village North of Penang Island’s capital Georgetown. Here he pulls up a fish trap full of prized grouper fish. Photo by Rod Harbinson/RodHarbinson.com. The island of Penang, which lies off the west coast of peninsular Malaysia, is famed for the British colonial era architecture that won its capital, Georgetown, an inscription on the UNESCO World Heritage list. These days, though, soaring land prices mean most of the development is high-rise. Housing 2,372 people per square mile as of 2010, the island is the most densely populated place in Malaysia. With demand for real-estate high and land scarce, developers have ambitious plans to build out into the ocean by reclaiming coastal land and building islands made of sand — a drive supported by the Penang State government. Reclamation projects have already been completed next to the second Penang bridge, which stretches 24 kilometers (15 miles) to the mainland from the island’s Southeast coast. Another reclamation scheme, known as the Seri Tanjung Pinang Project has also launched. Stage one, referred to as STP1, was completed in 2006: the 97-hectare (240-acre) extension to the shoreline northwest of Georgetown is filled with luxury housing and an upscale mall. The project’s second phase (STP2), which involves the construction of a new island as well as additional coastal reclamation, is currently underway. When STP2 is complete, it will bring the project’s total amount of reclaimed land up to 404 hectares (1,000 acres) of condominiums, shopping malls and leisure facilities. The project will also reclaim a 131-acre coastal strip for a government park. Plans are also afoot for an even bigger reclamation project on the South of the island at Permatang Damar Laut. All of these plans have been contested by environmentalists concerned about the impacts on dwindling mangroves, fisheries and birdlife – not only at the construction sites themselves, but also at the mine sites supplying vast amounts of rock and sand. Penang fisherman Liew Hock Choon delivers his catch of grouper to a local restaurant keen to buy them. Photo by Rod Harbinson/RodHarbinson.com. As Liew and I motored back to shore, we were escorted by a security launch. Guards on board shouted a warning for us to leave the construction area. On our port side, a rock bund wall was being filled in with sand by diggers, indicating the edge of the new reclamation island. On our starboard, out to sea, tug-boats, pontoons, dredge-ships and sand transport barges filled the sea with heavy construction traffic. “That is Rat Island” said Liew, pointing to an outcrop of boulders and mangroves that houses a cemetery. A pair of white-bellied sea eagles (Haliaeetus leucogaster) took off from the rocks as we approached, one carrying a fish in its talons. According to the Environmental Impact Assessment (EIA) for the second phase of Seri Tanjung Pinang, these eagles are one of ten bird species that are “Totally protected” under Malaysia’s 2010 Protection of Wildlife Act, among a total of 73 bird species found to be inhabiting the project area. “Those are the only mangroves left,” said Liew pointing to a few isolated trees. 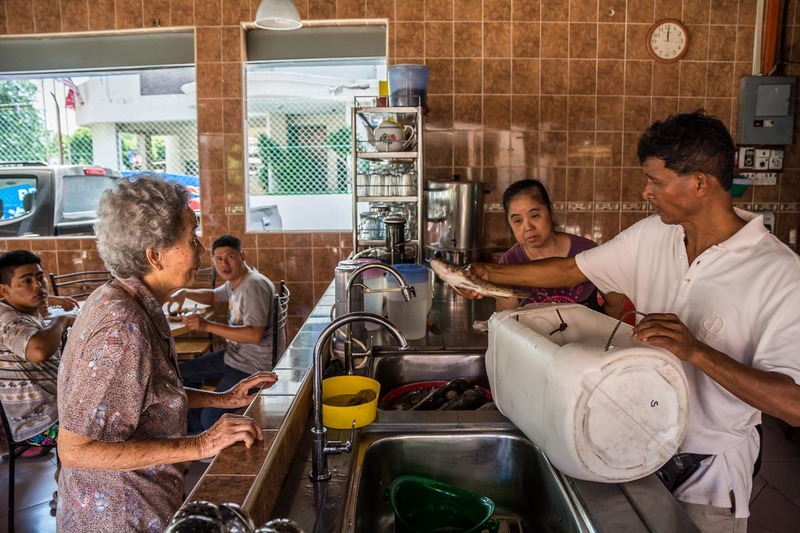 Because they provide essential habitat as fish spawning grounds, Liew is especially concerned about their loss, explaining that mangroves used to line the coast all the way to Georgetown six kilometers away. These will disappear with the planned coastal expansion under STP2. Reclamation building works underway as part of a new island being constructed by the Seri Tanjung Pinang company, a subsidiary of Oriental and Eastern company. Photo by Rod Harbinson/RodHarbinson.com. “We have another 760 acres to go,” said Jonathan Yeoh, manager of group corporate strategy with Eastern and Oriental, the development company whose colonial-era flagship hotel graces the waterfront of Georgetown. It will retain its waterfront view, said Yeoh, but many other buildings will overlook the new island, known as STP2, to be connected by two bridges. E&O subsidiary Tanjung Pinang Development is coordinating construction of the project. Yeoh said his company could not comment on the master plan, which remains confidential. However, he was keen to stress that the island developers will set aside “30 percent” to cater for low-cost local housing. A Chinese contractor, China Communications Construction Company Ltd is undertaking the works, via its wholly owned Malaysian subsidiary. The company, which claims to be the “world’s largest dredging company,” has considerable experience. As well as working on the 24-kilometer long Penang bridge, it was also involved in construction projects at the Hong Kong and Macao airports. A representative told Mongabay that while it was overseeing the works, it also employed local workers. Reclamation building works underway as part of a new island being constructed by the Seri Tanjung Pinang company. Photo by Rod Harbinson/RodHarbinson.com. The reclamation works entail removing existing mud from the seabed. This dredge waste is dumped at a designated site about 40 kilometers to the North of Penang Island. Two million tons of rock plus steel piles will create the outline perimeter of the island. This is being filled with 33.1 million cubic meters of sand to eventually create the island and raise the level high enough above the water level to weather high tides and storms. The EIA says that shipping this quantity of sand will be done by 10,000 cubic meter barges requiring 3,820 trips over five years, each one of 171 kilometers. The sand is being shipped from the Malaysian state of Perak, where it is being dredged from the seabed about 40 kilometers offshore. The Perak state government expressed alarm at the plans on March 12, citing potential environmental implications for its pristine islands such as Pangkor and the Sembilan cluster of nine islands. Perak First Minister Zambry Abd Kadir told the New Straits Times the state government “was in the dark over the matter.” Although the central government makes decisions concerning matters in coastal waters over three miles offshore, the minister complained that the State government should have been informed. Questions remain about whether the authorization to mine sand in the area has been renewed. “The EIA was approved in 17 Sept., 2007. We got a response from the Department of Environment Perak. They said approval has lapsed and that if they want to carry out the mining activity they will have to submit a new EIA. We will write to the Government again to see if it was submitted or not,” said Friends of the Earth’s Sangaralingam. Condominiums built as part of the Stage 1 reclamation project tower over Tanjung Tokong beach. Photo by Rod Harbinson/RodHarbinson.com. Another development on the drawing board is the Penang Southern Reclamation (PSR) project, which is being developed by the Penang State government as a way to raise funds for an ambitious transport infrastructure program. The project would see three reclaimed islands, covering a total of 1,659 hectares, being constructed off the coast at Permatang Damar Laut. This project, set to begin in 2018, has yet to receive final approval. Natural Resources and Environment Minister Wan Junaidi Tuanku Jaafar on Dec. 28, 2016 requested that all reclamation projects in Penang be put on hold. He cited concerns about the extent of the projects. He also said that it would be preferable to follow new national environmental survey methods for Environmental Impact Assessments, currently being finalized. With reclamation projects to north, east and proposed in the south, expert assessments indicate that the entire physical structure of the island could be affected, explained Sangaralingam. “The whole geomorphology of the island will change. The flow of the currents will also change. There will be impacts to fisheries,” she said. 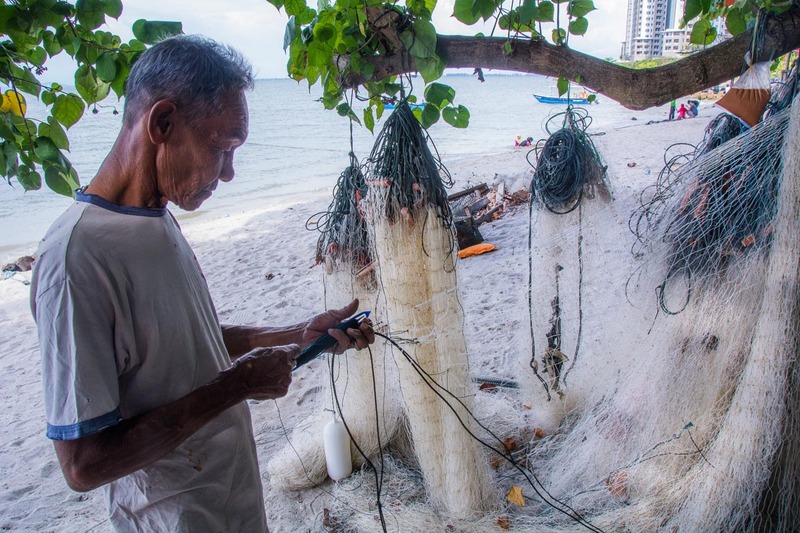 Mr Kamaruddin, 70, fixes his net on the beach next to his home at Tanjung Tokong, Penang Island. Photo by Rod Harbinson/RodHarbinson.com. Fisherman Mohd-Ishak Bin Abdul Rahman was among a thousand fishers who took to the sea on January 13 to protest the effects of land reclamation projects on their livelihoods. “We are not asking for compensation,” said Mohd-Ishak who is Chairman of the Northern Fishing Community Group of Tanjung Tokong where the flotilla of around 450 fishing boats displaying protest banners set sail. “We are asking the company [Eastern and Oriental company] to pay 200,000 ringgit for new fishing equipment to enable us to continue fishing,” he said. The decline in fish stocks has hit fishers’ incomes, and all complained they now catch fewer fish than before the reclamation began. Mohd-Ishak says that where they can no longer fill demand, buyers are looking to Thai fishers eager to oblige. Inshore fishers from the community say that their fishing grounds were a short distance away until the project started. Now they have to motor much further out to sea, crossing a treacherously busy shipping lane in the process. Unprotected by the shore, the fishers encounter higher waves that can only be navigated with bigger boats and more powerful engines, Mohd-Ishak explained. Deeper waters require deeper, heavier nets — all of which require considerable investments for which bank loans are not easily available. “Now we must go further out and use a big engine and a big winch. We need a winch to pull the nets. We cannot pull by hand. We are asking for these things but up to now they never give any answer,” said Mohd-Ishak. Penang fisherman Liew Hock Choon prepares his fishing boat to go a collect his fish traps in the reclamation area. Photo by Rod Harbinson/RodHarbinson.com. Last year, Malaysia’s Fisheries Development Authority (LKIM) gave each licensed fisher 15,000 ringgit. “It was not compensation, we call it consolation,” said Mohd-Ishak echoing widespread discontent over the payment amount. “There was no agreement, no nothing attached to the 15,000. Now we fight. We say we never asked for 15,000. We don’t know who accepted this figure.” he said. Fisherman Mr Mohd-Ishak (left) is Chairman of the Northern Fishing Community Group of Tanjung Tokong on Penang Island. Photo by Rod Harbinson/RodHarbinson.com. Mohd-Ishak says he has, “Written letters to all the agencies at the state and federal levels but there is no answer. No nothing. I also wrote to the LKIM, the federal body.” Mongabay contacted the LKIM about Mohd-Ishak’s complaint but did not receive a response. The coastline has already been transformed beyond all recognition from the first reclamation project. Now, the beach where the fishing community of Tanjung Tokong lives and keeps its boats is the last natural stretch of beach remaining in the area. Mohd-Ishak lives in a basic compound in a rudimentary brick bungalow that he built himself behind the beach, which is now surrounded by luxury high-rise condominiums towering over the beach community. One of the main complaints fishers have is that the building works have led to a decline in fish stocks, which they mainly attribute to increased turbidity due to the reclamation dredging. Mr Kamaruddin, 70, is fixing his net on the beach next to his home at Tanjung Tokong, Penang Island. Photo by Rod Harbinson/RodHarbinson.com. Kamaruddin, 70, is fixing his net. He points to a large net cage explaining, “Until five years ago I put that in the sea to keep my live crabs in, but then they started dying from the silt if I left them inside overnight.” He showed Mongabay two concrete tanks he now uses instead. “Hopefully Penang will become the new Singapore,” said taxi driver Loh Hock Seng, who is excited about all the development taking place. As fisher Mohd-Ishak points out, Singapore no longer has a domestic inshore fishing fleet, relying instead on aquaculture and imports from neighbors such as Malaysia.